Discussion in 'Replica Props' started by Mooniteman, Oct 21, 2011. I'm putting together a Dread Pirate Roberts (Princess Bride) costume for halloween - I've been slacking since I assumed this would be easy, but being the detail monger I am - I wanted to get any opinions or knowlwdge anyone has on this particular outfit. So I'm open to any suggestions or would love to see anyone that's attempted this. you have 2 pictures from the movie??? 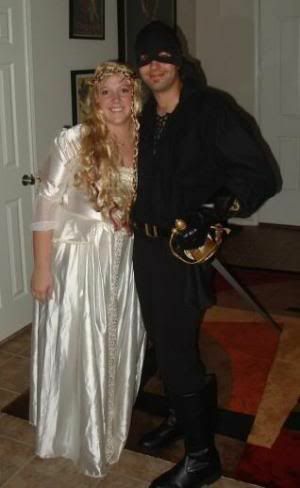 I did a Dread Pirate Roberts costume a couple of years ago. The shirt is just a basic Renaissance-style pattern with a metric ton of ruching on the shoulders. For the mask, I did a papermache mold of my upper face and glued on a piece of soft black leather. What is this "ruching on the shoulders" you sepak of ? And I don't know why i said this was all I had - I obviously have the movie - I just got lazy when posting my pics. This is the only picture I have from my costume several years ago... The shirt is just a basic "pirate" shirt I bought at a Halloween store. Same goes for the boots. The pants were just basic thin black sweat pants/leggings. Princess Bride Swords - Costume Pictures, too!